The celebration of the 7th People’s Congress held at the Oval Plaza, General Santos City on November 11, 2010 was mind-blowing and awe-inspiring! 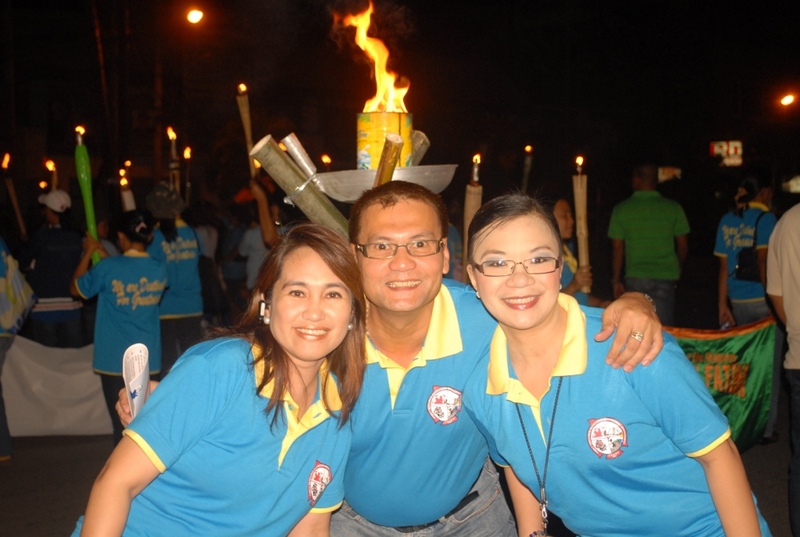 This year’s theme is Pagliwanagin ng FRAME ang Pamumuhay sa Gensan. The Family Resource Allocation & Management Enhancement (FRAME), a poverty alleviation program of the city, started with only 23 members in 2003 and have tremendously grown to 32,000 members (and counting!) in its 7th year. 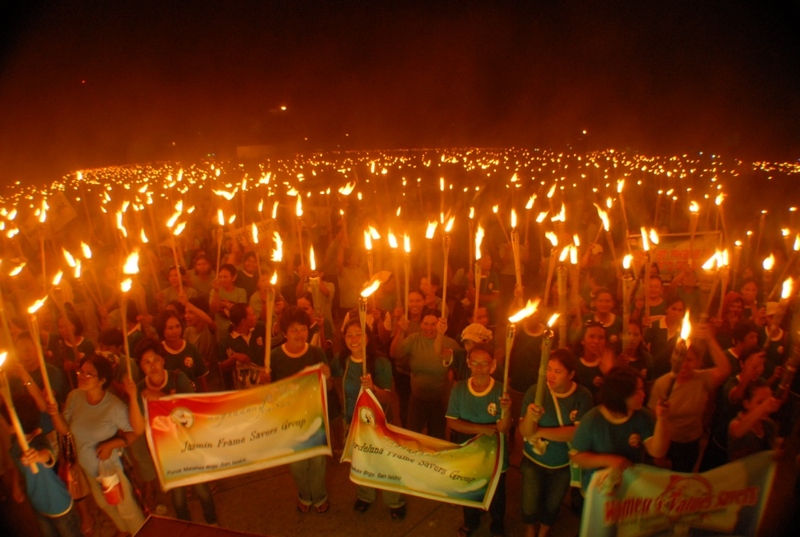 The 6th People’s Congress in 2009 was held at the Lagao Gym with almost 10,000 in attendance. Last year’s membership has more than tripled in just a matter of months! 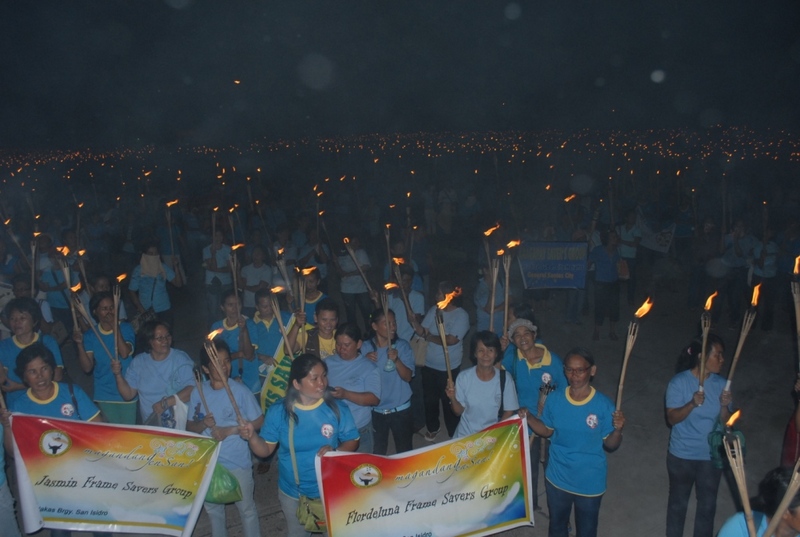 As early as 2:00 pm, members from far-flung barangays like San Jose and Batomelong started to gather at the venue. At 3:00 pm, the police enforcers re-routed the traffic to pave the way for the historical event.At 5:oo pm, the members started to take their spots. At 5:45 pm, everyone was eager to get the celebration started. 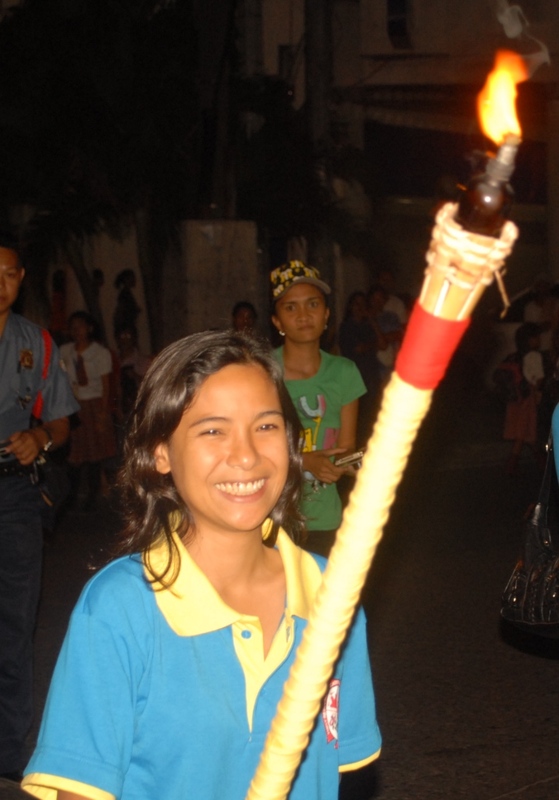 At 6:00 pm, Mayor Darlene Antonino-Custodio started lighting the first torch at the Plaza Heneral Santos. 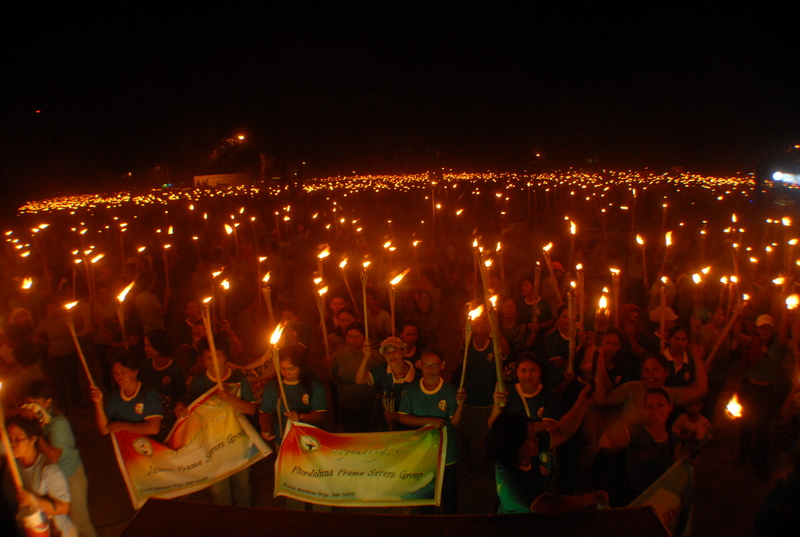 A few minutes after, the flame started moving simultaneously into two directions: Pres. Roxas Avenue and Pendatun Avenue converging at Oval Plaza. The torch lighting was a symbolic gesture that declares the city’s commitment to dispel the darkness of apathy, mediocrity and poverty. It was also the physical manifestation of the power of synergy. The event served as a reunion of sorts for the “Today With The Generals” production team: Direk Egai Cadiente, General Glenn Gonzalez, General Elvie Eullaran-Albano and I. Hosting with the two other top-caliber Generals has always been an enriching experience for me. Sharing the same platform with them is a privilege! 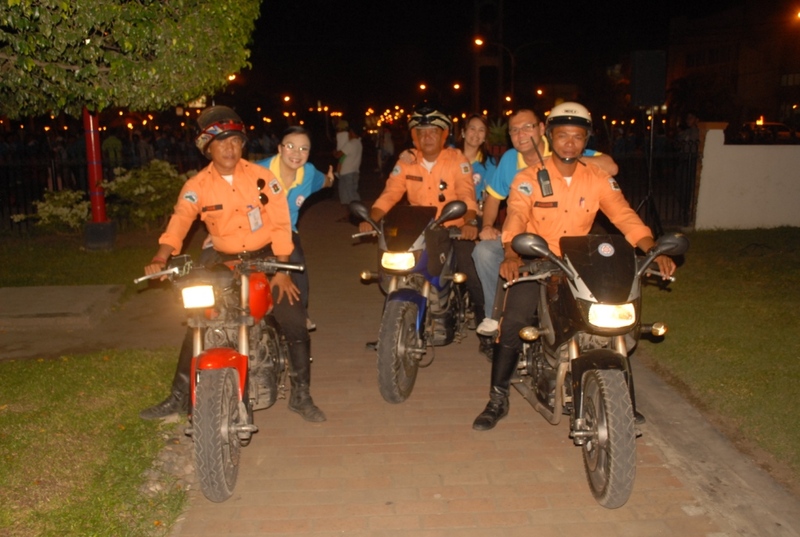 While the torch light was being passed to both directions, I joined General Glenn and General Elvie in mounting the motorbikes of the Traffic Enforcers assigned to transport us from the starting point to the Oval Plaza. We felt like we were filming another version of our Today With The Generals MTV. When we arrived at the Oval Plaza, we made sure that we passed by the technical booth to inform Egai that we were done with the preliminaries at Plaza Heneral Santos. He cued the Centerpoint Band to get ready for their part. Our childlike demeanor was heightened a few minutes after we mounted the Oval Stage to formally open the celebration. 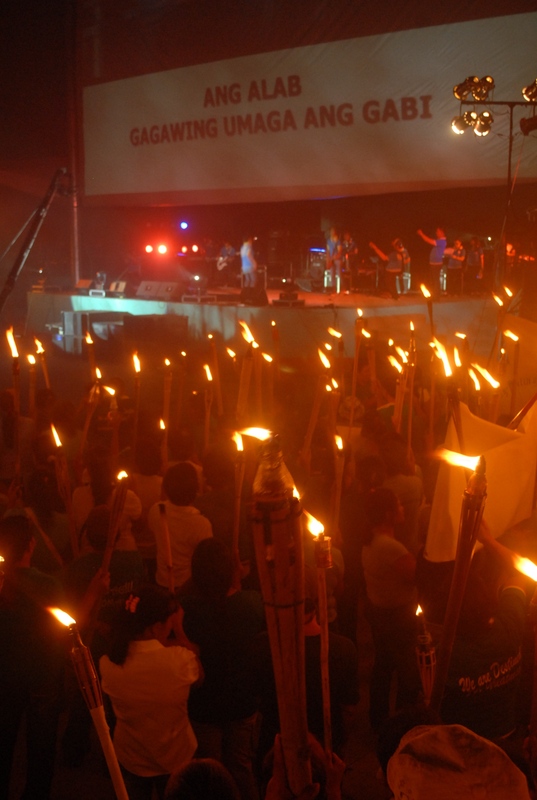 With goosebumps, we savored the sight of about 20,ooo torches being lighted . It was like watching thousands of fireflies converging at the Oval Plaza. 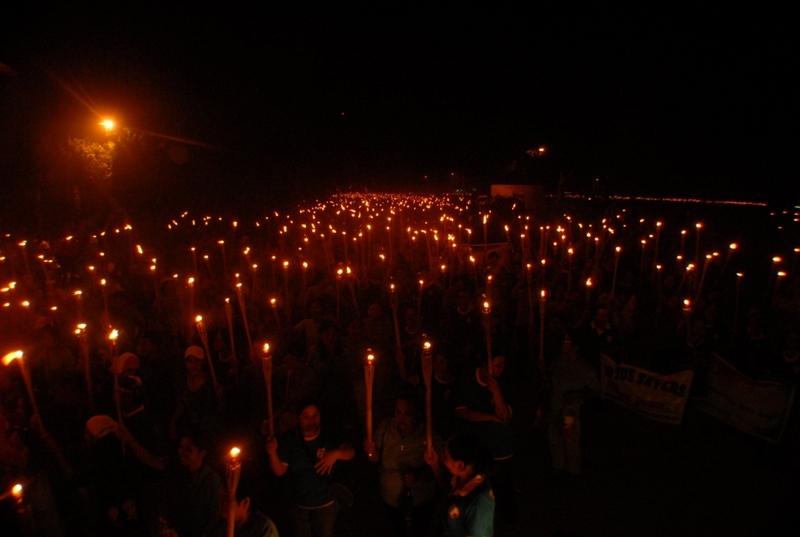 It was like a sea of flame engulfing the darkness. It was like blinking Christmas lights spread all over the area! What an enriching experience! "Ang Alab Gagawing Umaga ang Gabi"
As the contingents from the 26 barangays of the city inch their way to the venue, the CENTERPOINT BAND performed their original composition aptly titled Sa Liwanag. The impact of the experience was intensified! 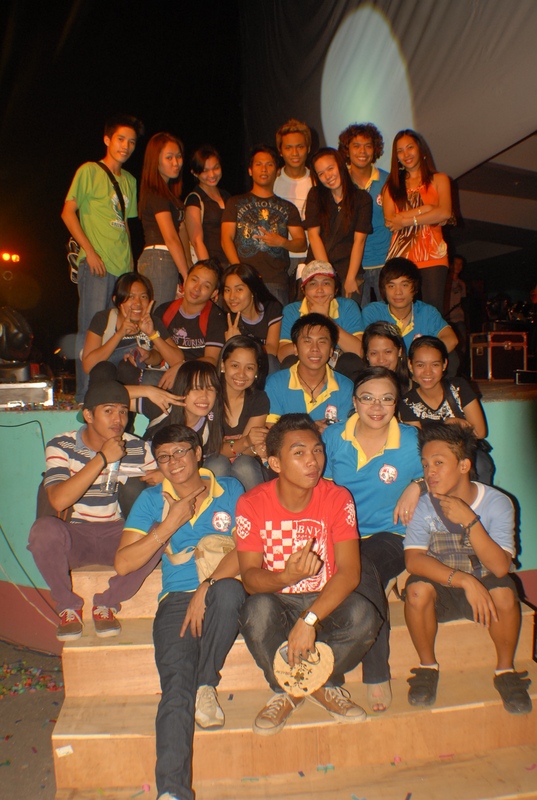 The Liberal Arts students of Ramon Magsaysay Memorial Colleges provided the necessary support to the production team. Jai-jai Alonzo readily said yes when invited to be the Stage Manager (SM). Sir Bing Cariño made sure that the RMMC Teatro Ambahanon will be available to add color to the celebration. 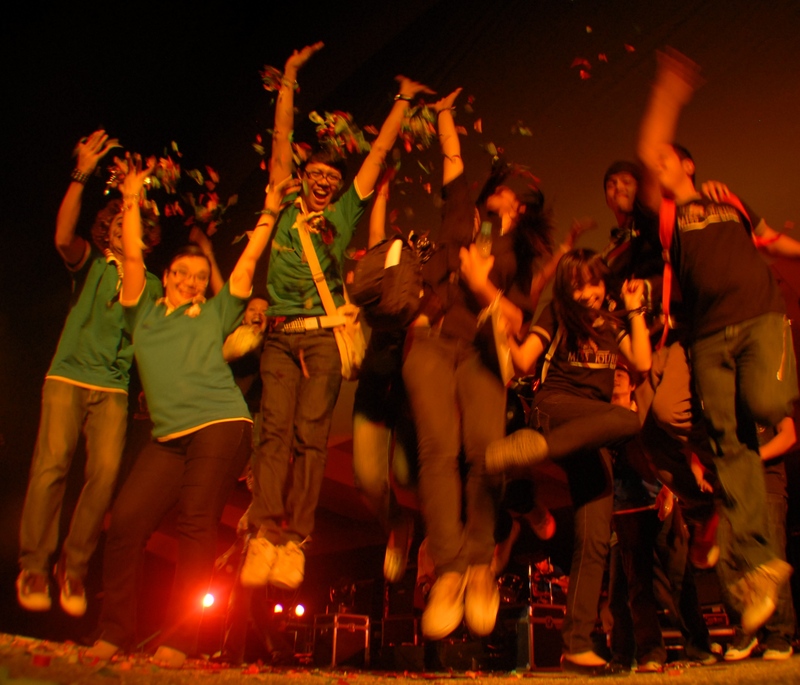 As volunteers, the students did not mind the long hours of preparations. It is always a joy working with my children from the L.A. Department. My Production Assistant, Gwen Sumabat, was all-out in providing necessary support. She made sure I succeed in my hosting by keeping me hydrated. She even found my NuSkin Lip Tint which I thought got lost while I was in transit from one stage to another. 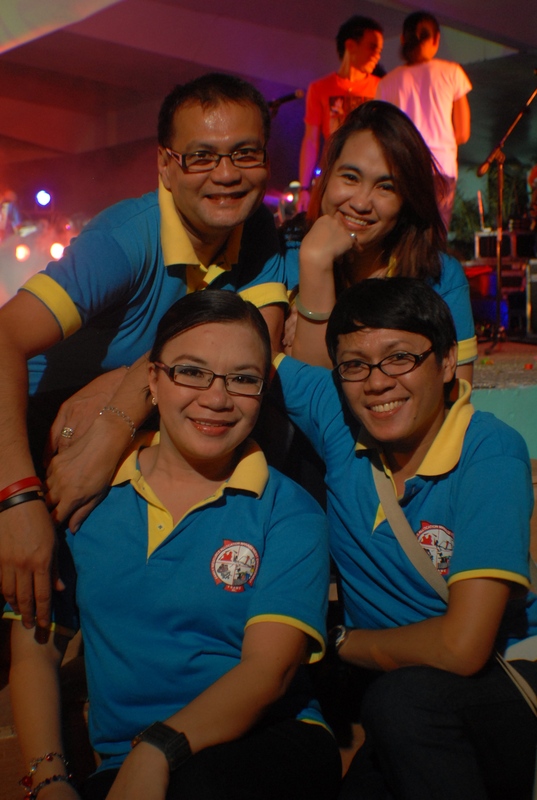 Marilou Consad, Karla Ocaña, Reggie dela Rosa, Mia Rocacorba, Reinna Pico and Deejay de Vera provided much-needed help. And not to be outdone is Niña Grace Urdaneta who is bent to finish what she has started. It's always a joy working with Direk Egai, Gen. Glenn and Gen. Elvie! The students consider it a privilege to be trained by Direk Egai who never fails to bring out the best in everyone he works with. General Glenn, General Elvie and I consider it a joy to partner with him. Thank you, my dear friend, for your passion for excellence! Thank you, Pastor Andoy Docena (DBC Senior Pastor) and Ma’am Rebecca V. Magante (CSWD Department Head) for giving us the privilege to work together in this event. Everyone was bursting with inspiration! Let’s keep the flame burning in our hearts! All photographs in this post (except this one taken by Binoy) are courtesy of Mosler Paul Lapore. 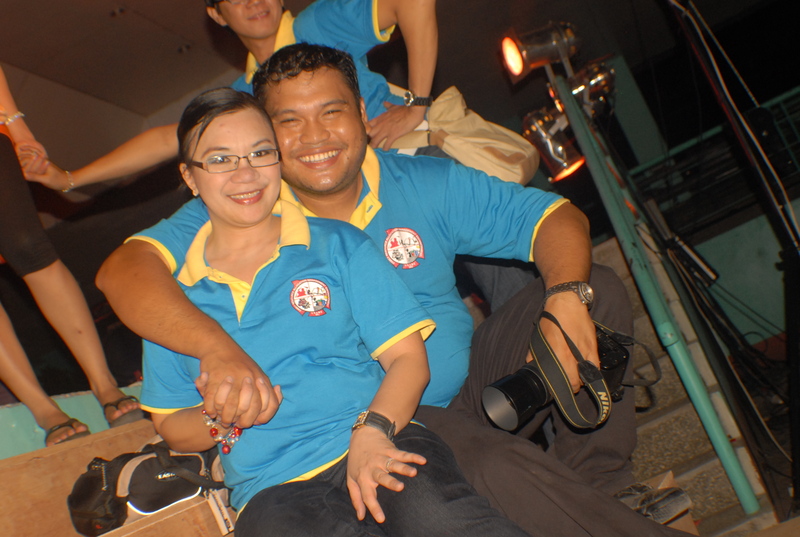 Thank you, my Piao, for capturing the moments.